Explore the Seven Mile Miracle known as O`ahuʻs North Shore. Winter brings big waves and world class surfing, while the summer is calm and perfect for snorkeling with turtles, or a beach day. Waimea Valley Falls, Hale`iwa Town, and of course Dole Plantation, are great all year round. Come see what all the fuss is about! Youʻre going to love the North Shore! Of course the beaches and surfing are a hug draw, but the North Shore has unique shopping, art galleries, and amazing food. Guests are picked up at virtually any hotel, airport, or location and given a personalized private tour of O`ahu. Choose the perfect sights and activities for you and your family, swimming, hiking, shopping, great food, photography and much more. Choose between Your Half Day (6-Hour) Tours, Your Full Day (9-Hour) Tours, and Your Long Day (12-Hour) Tours. Your North Shore Tours will give you great options like swimming, snorkeling, shopping, a waterfall hike, great photography spots and amazing food. Visit Hale`iwa Town for great shopping at places like the North Shore Surf Shop, The Old Waialua Sugar Mill, or Clark Littleʻs Gallery just to name a few. Stop to see the turtles in the ocean, or the beach, you can even paddle board or kayak up the river with them if you want to. Watch world class surfing in the winter time or snorkel in the summer, either way, you will have a blast! Combine the North Shore with Waikele Outlets, Aloha Stadium, Hanauma Bay, Diamond Head, Dole Plantation, Nu`uanu Pali Lookout and so much more! 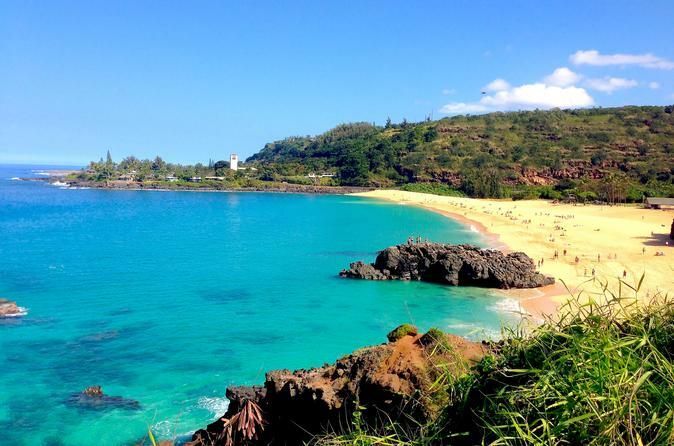 Choose from attractions like Sunset Beach, Banzai Pipeline, and Waimea Valley or Bay. Your options are virtually limitless, and every experience is tailored to your groups wishes and tastes.